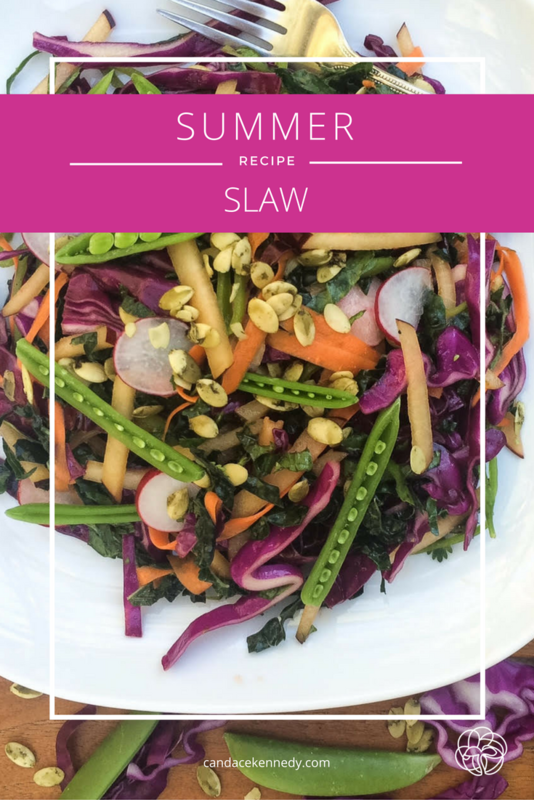 Looking for a summer slaw that tastes just as beautiful as it looks? Fresh mint and basil, plus the season’s best stone fruit give this colorful slaw a summertime taste that’s great for a dinner party, picnic in the park, or even a healthy lunch. The wide variety of vegetables and herbs makes this salad extra nutrient-diverse. Plus, it’s just really pretty to look at. After washing, chopping, and prepping all of the veggies for the slaw, throw them in one big bowl. Add the salad dressing, herbs and sea salt. Give the salad a good toss, until everything is evenly combined. Set the salad aside (the fridge is a good idea) and let it sit for about 30 minutes. The acids in the salad dressing will start to break down some of the toughness of the kale and cabbage. This will also give your salad a chance to let all the flavors mix and mingle. Add the pumpkin seeds on top. Marvel at all the beautiful summer colors and flavors. Exactly! It’s not just pretty to look at 🙂 lots of colors and veggies equals lots of different nutrients! I hope you enjoy!